Using Decking in and around your garden can help create the perfect garden landscape alongside giving your garden a more practical side. Decking is a very good thing to have in your garden and is not just used for creating spaces within your garden, but it also can be used to create paths, walkways and can even add a dimension to your garden with raised decks. When the decking is fitted why not add balustrade around the edge of your decking which can be basically used as a safety barrier to stop children from falling or slipping when it has been raining. 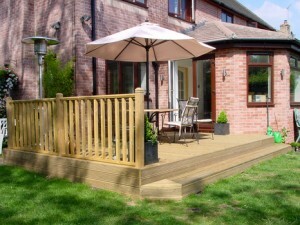 Whatever type of decking you want in your garden our St Helens Gardeners can fit it professionally and expertly to suit your and your family’s needs.